Your child is talented – talented enough to make it to the highest levels of competition, like the Olympics. You’ve driven her countless hours to and from practice, begged time off from work yet again to be with her at a meet, cried out when she fell, massaged her creaky calves to make the pain go away, wept as she was carted off for surgery, and went bananas upon the moment of her triumph. 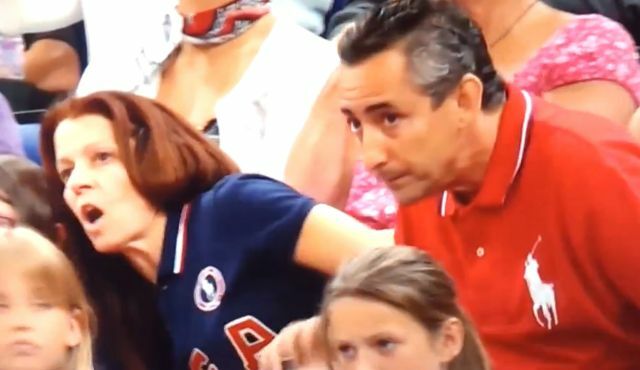 The video at the top of the page is of the parents of Aly Raisman, who won gold medals in the team and floor women’s gymnastics competitions at the 2012 London Olympics. The expressions, the body language, the sounds of the parents are so explicit that we cannot help but feel their anxiety. We understand that these parents have had their fair share of sacrifice, pain and joy. As the writer of the book, The Secret Olympian wrote, that is the price of athletic success for many. Aly Raisman was in St Louis for the US Olympic Team Trials in gymnastics. On June 26th, Raisman, at the rather elderly age of 22, won a spot on the American team headed to Rio in August. Can her parents stand the pressure? Posted in Gymnastics, Pop Culture, Rio Olympics and tagged 2012 London Olympics, Aly Raisman, The Secret Olympian, US Olympic Team Trials. Bookmark the permalink.